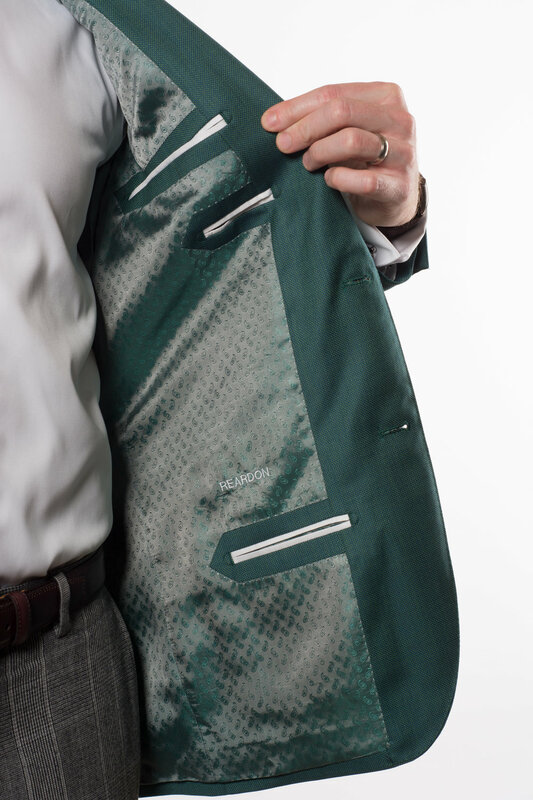 A surprisingly frequent request from new Hall Madden clients is an emerald green suit or blazer. While most suiting and jacketing fabrics are shades of grey, blue and brown, green — especially in an emerald jewel tone — is quite uncommon from fabric mills. A Chicago client, David R., liked this Super 120s birdseye wool fabric from Pallazo. This italian emerald green wool is year-round in weight (220g/m) and has a slight bit of texture to give it some shine. It’s slightly brighter than the famous Master’s Golf Tournament green jacket. 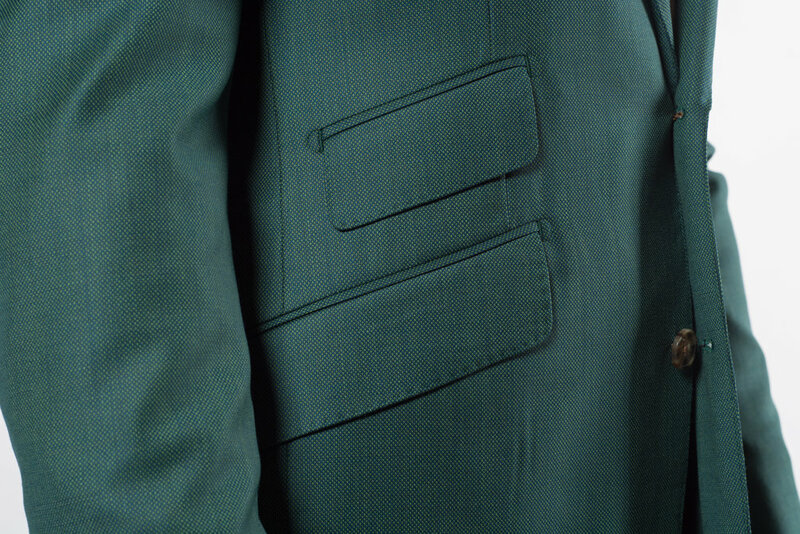 For design, the emerald jacket has a peak lapel, two-button closure with horn buttons, and slanted “hacking” flap pockets and a ticket pocket with dual rear vents. 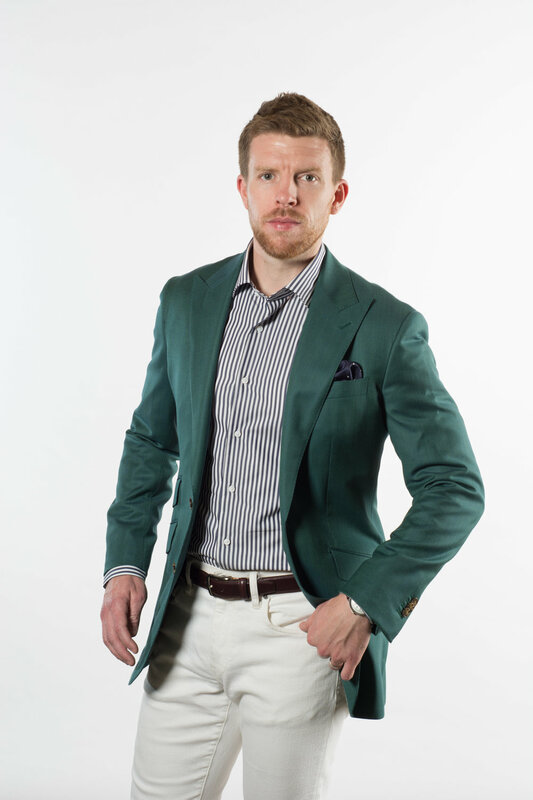 As an emerald green blazer, David has a wide range of options on how to wear it with Hall Madden custom dress shirts. First, with a crisp white French-cuffed shirt and glen-plaid grey odd trousers for a more dressed-up look, finished off with a white linen pocket square. Next, David wears the emerald green blazer jacket with a dark-navy, wide-striped dress shirt and white denim and a navy dotted silk pocket square. Finally, for the most casual look, the emerald green blazer is worn with a light blue shirt and dark denim blue jeans. We also envision that as a full suit in emerald green, this fabric could be paired quite easily with a lavender shirt or even a black merino polo turtleneck sweater. Available as a blazer ($1150) or full suit ($1400) custom-made by Hall Madden.